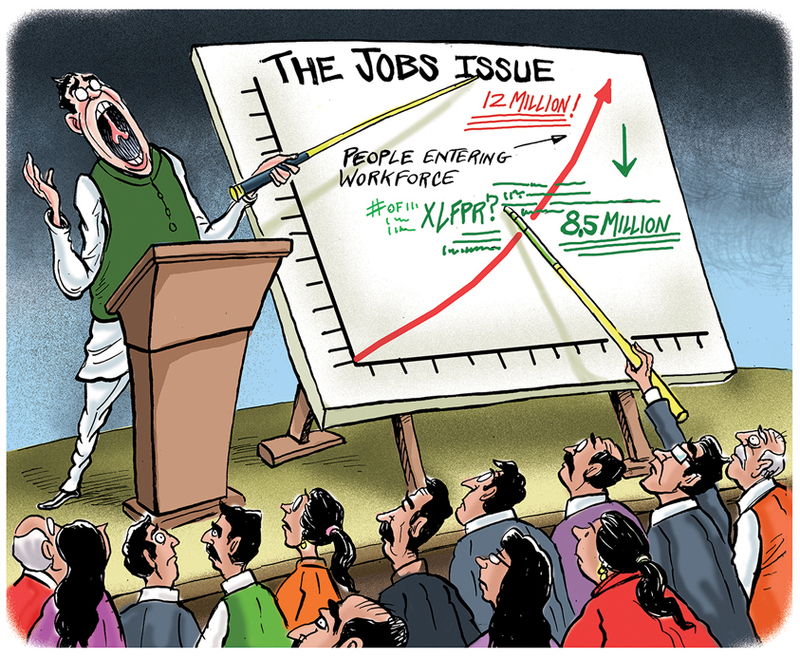 There is consensus that a top priority for India is creating jobs, especially jobs that pay well. Surprisingly, there also seems to be consensus that we are adding approximately one million new job seekers each month. This was the figure Congress president Rahul Gandhi highlighted when speaking at the University of California at Berkeley and Princeton University the past September. At UC Berkeley he referred to 12 million young Indians entering the job market every year and at Princeton he placed the figure at 30,000 per day. While there was much dissection of Rahul Gandhi’s speeches, no one questioned these numbers. It is surprising that on an issue so central to policy making, we have accepted the most critical statistic without scrutiny and centred all jobs debates and analyses on it. The origins of the statistic are difficult to trace but nearly all analysts and institutions pronouncing on the job situation in India are using it. But some simple calculations that economist Rahul Ahluwalia has generously done at my request convincingly demonstrate that this figure overstates the likely correct figure by a solid 50%. The number of individuals entering the workforce in any given year is obtained by multiplying the absolute number of additions to the working age population that year by the labour force participation rate (LFPR). The latter measures the proportion of the population that participates in the workforce. Because not everyone who attains working age enters the job market, the LFPR is usually a number smaller than one. A 2006 report by the technical group on population projections constituted by the National Commission on Population (NCP) provides estimates of population in different age groups for years 2011, 2016 and 2021. The report’s estimate of the total population in 2011 is within 1.5% of the actual population as measured by the Census 2011. This error is smaller than those in the estimates provided by the United Nations and the United States Census Bureau. The report places the population of individuals older than 15 years at 929 million in 2016 and 1,003 million in 2021. These figures imply an addition of 74 million working age individuals to the population in five years or approximately 15 million per year. The figure being larger than 12 million per year, addition of one million per month to the workforce is not ruled out. It turns out, however, that the labour force participation rate in India is unusually low. The latest estimates we have are from the 2011-12 Employment-Unemployment Survey by the National Sample Survey Office (NSSO) and 2015-16 Employment-Unemployment Survey of the ministry of labour (MoL). Applying the LFPR in these two sources to the addition to working age population estimated by the NCP technical group, Ahluwalia finds the number of those entering the workforce annually between 2016 and 2021 to be 7.5 and 7.8 million, respectively. The approximate number of jobs seekers thus turns out to be a good 4.2 to 4.5 million smaller than the 12 million figure that is defining the current debate and policy formulation. These figures are by no means definitive. The LFPR during 2016-21 may turn out to be different from those in the NSSO and MoL surveys. But even applying the LFPR in the 2004-05 NSSO survey, the highest such rate observed during the past 25 years, the number of new entrants per year rises to only 8.5 million, a far cry from 12 million. It is nobody’s case that fewer entrants to the workforce than previously thought make our jobs problem go away. The point, instead, is that our debates and policy analyses need to be conducted using as accurate numbers as may be available. A smaller number of entrants may mean that the problem is not as insurmountable as it may have seemed. It may also imply adjustment on the margin to policy priorities between jobs and other objectives. A different but related issue worth flagging here concerns the current trend in the LFPR in India. Between 2004-05 and 2011-12, India experienced a significant decline in LFPR. The rate fell particularly sharply from 33% to 25% among rural women. The phenomenon of U-shaped LFPR for women, whereby the participation rate first declines with rising per capita income and then turns back up has been well documented in development literature. Starting at low per capita incomes, rising incomes may lead to a withdrawal of women from workforce for a variety of reasons: Women may choose leisure over work once the family income rises above a certain threshold; social stigma associated with working in the field may encourage withdrawal by women once such work is not necessary for subsistence; rising capital intensity of agriculture may asymmetrically substitute for women’s labour; and progressively increasing number of women may choose education over work during early adulthood. While the sharp decline in LFPR of women is, thus, explained, it remains disturbing since it has taken place from an already low participation rate among rural women. Insofar as possible, policies must pay particular attention to facilitating the expansion of jobs that would help bring women into workforce in larger numbers.